Following the attack on the DAO that occurred on June 17, 2016, a pseudo-anonymous group calling themselves the Robin Hood Group (RHG) launched on June 21, a white hat attack on the DAO to secure the remaining 7.2M ether that remained in the DAO. This attack was intended to be a safety net in case the desired outcome of a hard fork (the outcome wanted by, among others, Slock.it — creators of the DAO framework) did not materialize. That outcome did occur on July 20, 2016 and it resulted in a fork that allowed all the ether held in the DAO to be returned to DAO token holders. However, after the fork, the original chain did not die as expected by ethereum developers. Instead, branded as Ethereum Classic (ETC) it was listed on Poloniex and other exchanges with the market currently pricing ETC at almost $2 per coin. The hard fork resulted in two chains, with each having value and each being identical prior to the hard fork. This meant that the RHG unexpectedly found themselves custodians of 7.2M ETC, currently valued at almost $15 million. This article is about who the RHG is, what they have done and are doing with those 7.2M ETC and why they took the actions they did. Who is behind the Robin Hood Group? He also stated that this was not done by the Ethereum foundation, but by him and a “couple colleagues”. Who are these colleagues? From social media posts we have a good idea of who was affiliated with the RHG. Slock.it’s Lefteris Karapetsas and Griff Green have acknowledged being part of the RHG on reddit. Both responded multiple times speaking on behalf of the RHG. In fact, both reached out, unprompted, to u/DeviateFish_ who shared the following screenshots. 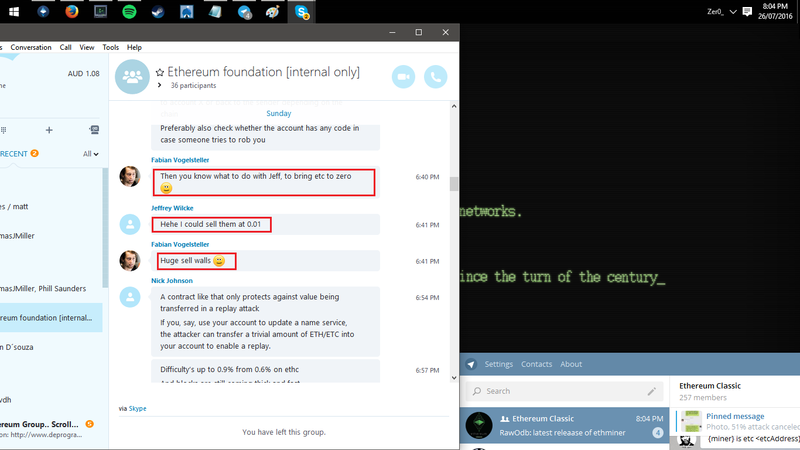 Moreover, according to Stephan Tual (u/Ursium) the RHG white hat attack was aided by “individuals from the eth foundation, devs, security experts, ethcore, slock, etc”. Figure 4: Stephan Tual claiming that a lot of people came together to respond. In summary, it seems that the RHG is made up of some employees of Slock.it (Karapetsas and Green) as well as at least one member of the Ethereum Foundation (van de Sande). It also seems that other members of the Ethereum Foundation (Vogelsteller) and Slock.it (Tual and Jentzsch) at least had very good knowledge of the RHG and its actions. Who does the ETC belong to? The vast majority of exchanges who held ether before the hard fork have decided that the ETC resulting from the fork belong to their users and have returned, or have promised to return the ETC. His point is an important one — custodians have a responsibility in the event of hard forks to preserve coins on the secondary chain after the hard fork, at least that has been the case for this hard fork. It would seem then, based on the consensus among exchanges, that the ETC held by the RHG, the custodian of the recovered DAO ether, should be the property of DAO token holders. And returning the ETC to DAO token holders (at least the fraction of the DAO ETC that was recovered by the RHG) would not be a technically difficult thing to do. The aforementioned u/DeviateFish_ explained why a straightforward return of ETC to the DAO token holders was possible and even drafted a solution for it. The Robin Hood Group’s actions post hard fork. In figures 2 and 3 above, Karapetsas and Green acted on behalf of the RHG post hard fork (both messages from them were about a week after the fork), showing that at least up to that point, they were still part of the group. Alex van de Sande on August 8, however, distanced himself from the RHG, writing “ I wouldn’t call myself part of the Robin Hood Group” despite having previously claimed to be part of the group. van de Sande’s response seem to have been prompted by the fact that the ETC held in the white hat DAO had just been recovered by the RHG. van de Sande wrote about the RHG, of which he previously was chief spokesman, “ I do not know what they intend to do now”. On twitter he stated that he believed they would do “the right thing”. On August 10, 2016 almost 3M ETC was moved to exchanges unannounced from the white hat DAO. This action immediately raised suspicions that the RHG intended to sell this ETC. Initially, there was no communication from any of the previous sources of information from the RHG — the first communication came on August 12, 2016 in a reddit post by Jordi Baylina. Baylina’s post raised more questions however. He claims that because of repeated legal threats from large DAO token holders, they sought legal advice from Bity SA. But why not just simply return the proportional amount of ETC to DAO token holders? Why send them to exchanges? After having received repeated legal threats from various individuals holding significant stakes in The DAO (still continuing), we sought legal advice to help us pursue our goal without endangering ourselves or the salvaged funds. We found support and legal advice from Bity SA, a trusted Swiss entity. He also claimed he received “signals” from the community to distribute the ETC in ETH to “support Ethereum projects”. What signals were these? Why would a custodian think it appropriate to liquidate someone else’s ETC rather than simply returning the ETC? And how would this action “support Ethereum projects”? Did the RHG intend to use the ETH obtained from liquidating ETC for purposes other than returning to the DAO token holders? When the salvaged ETC were able to be recovered, signals were received from the greater community to distribute these ETC in ETH, to continue to support Ethereum projects. His post also hinted that exchanges had frozen the ETC that was moved to their wallets. Indeed, one wonders why the RHG thought that moving millions of dollars worth of ETC to exchanges wouldn’t have triggered some sort of review on the part of exchanges. all exchanges will be asked to return the funds to the Multisig wallets. Unmentioned by Baylina is the fact that Bity SA is not a neutral party in this situation, but was Slock.it’s legal partner during the creation of the DAO. Baylina’s post was further elaborated upon by a response from Bity SA on August 13, 2016 in which the abbreviation WHG means “White Hat Group”, presumably the same group that initially referred to themselves as the Robin Hood group. Bity acknowledges the close relationship with Slock.it and lays out a few reasons trying to justify their decision to sell ETC for ETH. None of those reasons, however, seem to this author to justify not doing the simple action of returning ETC to DAO token holders. Many of Bity’s claims were already refuted quite convincingly by u/DeviateFish_, so I will not repeat them. But I want to refute one of the new claims by Bity. They claim that the ETC chain is particularly susceptible to attacks that could “potentially kill the value of the chain”. Given that every potential 51% attack on the ETC chain has either not materialized or not been even remotely successful, it seems a dubious claim. 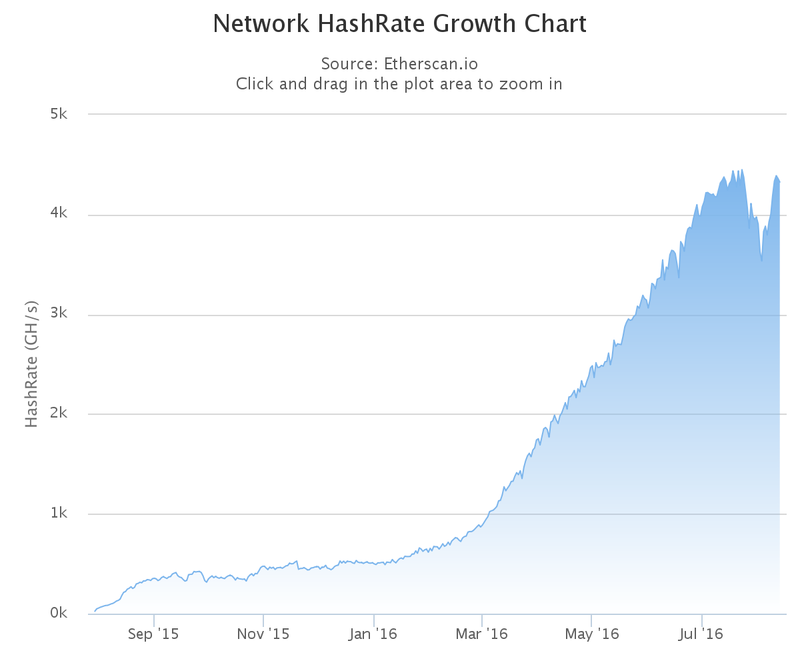 Further, ETC’s hashrate has mostly ranged between 500 Gh/s and 1 Th/s, a hashrate that is very similar to ethereum’s until only a few months ago. So ETC is no more susceptible to 51% attacks than ethereum was as recently as February or March of this year. while Kraken has frozen withdrawals pending official communique. Kraken was initially quite happy to let us continue to trade, as we are a verified money service business working closely with them for years, however they have also blocked our withdrawals waiting for our official communique. Unsaid is who are the signatories — Bity employees? Slock.it employees? Members of the RHG? Those addresses at the time of writing contain almost 3.4M ETC, about 21,000 ETH and about 168 BTC. Bity claims to have liquidated 14% of the ETC from the white hat DAO, which would be approximately 1 million ETC. That liquidation should have resulted in much more than the 21K ETH and 168 BTC. 1,000,000 ETC should have yielded about 150,000 ETH or more at prices around the time of Bity’s sale. 168 BTC would only have been around 8.5K ETH at that time, meaning that there is the equivalent of about 120,000 ETH worth of liquidated ETC that Bity were not able to withdraw from exchanges. Additionally, since we know they sent more than 2.9M ETC to exchanges, exchanges (mainly Poloniex) are holding at least 2 million ETC from the white hat. Astute readers will note that the 2.9M ETC sent to Poloniex combined with the 3.4M ETC held by Bity, does not total the 7.2M ETC originally in the white hat DAO. Presumably, the difference was sent to Kraken and is being held by them. Bity notes that Bittrex and Yunbi had released fund that were sold on their exchanges. These seem to be the funds in the ETH and BTC multisig wallets. Bittrex’ BTC-ETC market chart clearly shows where Bity sold their ETC. It seems they preformed a market dump, selling ETC up to 20% below market value at the time. So much for wanting to get the best value for DAO token holders. Bity continues their post by saying they have come to the conclusion that selling the ETC for ETH wasn’t the best course of action and now they want to return all the ETC to the DAO token holders, which would mean purchasing about 1 million ETC in order to make up for the amount they sold on exchanges. It also means that they have to plead with Poloniex to return the ETC that Bity had sent there to dump. The WHG, in conjunction with Bity, will focus all efforts on continuing to develop the smart contracts that will be used to distribute ETC to the addresses holding DAO Tokens at block 1,919,999. We hope the community can help us develop tools that will mitigate the risks that the DAO Token Holders will face. About 14% of the 7.2 million ETC was converted and it will be converted back as needed at our own expense to make sure all DAO Token Holders receive their fair distribution of ETC. Bity will have to rebuy the approximately 1 million ETC they sold, at a likely higher price than they sold at, in order to do the simple and straightforward thing of returning the ETC to the DAO token holders. The closing of Bity’s post belies one of their own claims for previously not wanting to return the ETC as-is. They claimed that the necessary tools were not available on the ETC chain, however their new plan is to make use of tools currently available in order to write a contract to return the funds with an “easy user experience”. In the coming days, the White Hat Withdraw contract will become available in Github. The community will be invited to audit it and test it. Once the testing period is done it will be deployed on the ETC chain and a website using the Mist Browser will enable an easy user experience that will accompany the smart contract. Why not just return the ETC to DAO token holders initially? As we’ve seen, Bity’s reasons for not returning the ETC to DAO token holders as-is are dubious at best, and instead, by their own words, doing so has turned out to be the best course of action for them. So why take the more complicated, and ultimately costly decision to try to return ETC as ETH instead? (I take them at their word that they were indeed going to return the funds obtained from selling the ETC, otherwise they would potentially have committed theft). One reason could be that (some) members of the RHG expected the ETC chain to be worthless after the hard fork, and moreover, wanted it to be worthless. Griff Green, a member of the RHG, has repeatedly referred to ETC as “deadETH” post hard fork. Also, Fabian Vogelsteller, who may or may not have been in the RHG, but who seemed quite knowledgeable on their work, shared a post on twitter referring to ETC as “a chain of thieves” and called that post an “interesting perspective”. 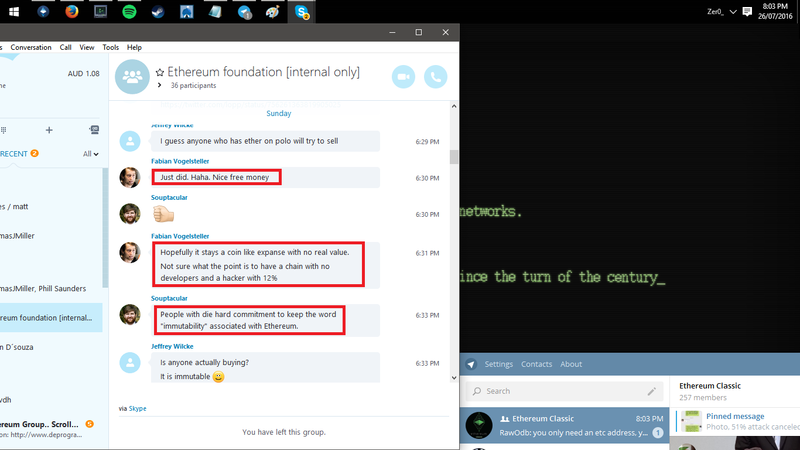 Further, in leaked Ethereum Foundation Skype logs, Vogelsteller encouraged fellow Ethereum foundation members to “bring ETC to zero”, by putting “huge sell walls” when Poloniex first listed the ETC market. Figure 9: Vogelsteller wanting to see the ETC price crashed. Stephan Tual, founder of Slock.it and lead facilitator of the DAO, expressed confidence soon after Poloniex listed ETC, that ETC would be valueless. Instead, ETC now has a marketcap that has ranged between $100M and $200M, and is currently trading at a significantly higher price than when Tual claimed it would be ignored. ETC’s marketcap is also not dissimilar from ethereum’s during the first 6 months after ethereum’s launch. On many days, perhaps most, since ETC was listed on Poloniex, its trading volume has exceeded that of ETH. Why this discussion of the price of ETC in relation to ETH? Well, there is a strain of thought that ETC’s continued existence and growth threatens ETH. Indeed, one of the most prominent investors in ETC, Barry Silbert has stated he believes in time, the market will decide that the ETC chain has more value than the ETH chain. That would almost certainly be an undesirable outcome for (at least some) members of the RHG. Prior to the hard fork Lefteris Karapetsas descibed a no hard fork outcome as a “nightmare scenario” while saying a hard fork would have been a “quick, simple and easy solution” to the DAO debacle. The continued existence and success of the ETC chain belies the “quick, simple and easy solution”. Vogelsteller expressed his desire for ETC’s price to be brought to zero and Green refers to ETC as “deadETH”. Not to mention that Green and Vogelsteller claim to have already sold whatever ETC they obtained after the hard fork (and likely at cheap prices). What better way to get ETC’s price to trend towards zero than by market dumping the millions of ETC (a significant portion of the ETC supply) under their control? In the end, the Robin Hood Group, despite their best intentions initially, clearly made a bad decision to sell the ETC under their control for ETH. And now, facing the threat of legal action, and exchanges that wouldn’t allow them to simply market dump the ETC, they have been compelled to do the legally and morally straightforward thing of returning ETC as-is to DAO token holders. Perhaps they simply erred in human judgment, but it is also possible, and maybe likely, that a desire to see ETC fail on the part of some members of the RHG, led them down this path. Thoughts on bitcoin and other cryptocurrencies.